All vibration training commences here, with the SDoF or single degree of freedom idea. One mass. One spring. One dashpot or damping (friction) device. And only one resonance. Such systems don’t exist in the “real world”, although accelerometer and electrodynamic shaker inner workings resemble the SDoF. Let’s invert that SDoF system and attach it to the vibration table of a small electrodynamic shaker driven by a power amplifier (not shown). We’ve adjusted the “forcing frequency” of the signal going into the power amplifier to match the nautral frequency of the spring-mass system. We have resonant magnification. If this was a video clip, you’d see that the motion of the spring mass is much larger than the “input” motion. This cantilever beam is much more complicated, and it can respond in many different ways. One would be the first or the “dividng board” response. We call this particular response the second bending mode. Observe the point of zero translation, called a node. Observe the area of maximum bending, called an antinode. That would not be a good location for a delicate component, if this beam represented a printed circuit card or PCB. Most of the time, the response displacements will be too small for us to see the response. In that situation, how might we identify what’s happening? We can try sprinkling salt on the beam. Vibration will cause it to migrate. It will collect at the nodes. Here we count 8 nodes, so this must be the 9th mode. How many are resonances there? An infinite number. Fortunately, only the first 5 or 6 interest us. Thus far I’ve been using sine or sinusoidal one-frequency-at-a-time vibration, nice and predictable, fine for classrooms. 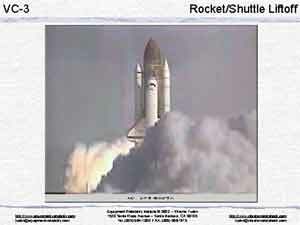 But in many real-world situations, such as this rocket lift-off, the vibration tends to be …. … random. By that, I mean that the time history, viewed on an oscilloscope, will not be nice and predictable like the familiar sine wave. It will be unpredictable. … the white light that here is passing through a prism. 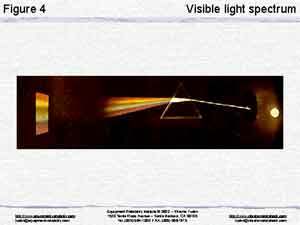 Do you remember this optical demonstration from Physics? Over on the wall we have a continuous spectrum. All the colors of the rainbow are present. 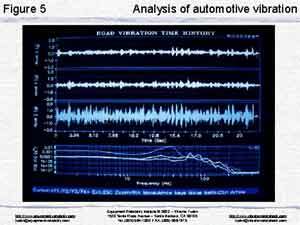 Is it possible for vibration to have a continuous spectrum? Yes! Three accelerometers are attached to an automobile’s axle. Those three signals are seen in the top three records here. Now let’s do a Fourier Transform into the frequency domain, with the results shown low on this slide. Notice that the “Power Spectral Density” or PSD is quite constant at frequencies 1 – 20 Hz. Then less constant out to maybe 200 Hz. Notice, please, that there are no “holes” in this continuouis spectrum. All frequencies are present in this random, unpredictable vibration. Build yourself a demonstrator like mine. A wood block about 3″ x 3″ x 1″ thick. Two 45 degree saw cuts. A bolt to hold the unit onto a shaker. Two metal reeds having different thicknesses, different natural frequencies, are clamped, pointing toward the camera. By doing a slow sine vibration sweep, we can excite the red reed at its natrual frequency of 22 Hz, or (a bit later) the white reed at its natural frequyency of 34 Hz. Or no reeds. With sine vibration, there will be no collisions. But with broad-spectrum vibration, perhaps 1-100 Hz, we see that we are simultaneously exciting both resonances. The reeds occasionally strike. If we were performing HALT or HASS here, we would use random vibration because it identifies failure modes that would never be seen with sine vibration. What did those reeds represent? Well, they could have represented two of the many cards in this aircraft or shipboard “card gage”. With test lab swept-sine forcing, at certain test frequencies a card may respond, one at a time. They don’t move far enough to collide with their neighbors. But with test lab random forcing, all respond at once. Collisions are inevitable. Just like in flight. Or when the ship’s guns fire. 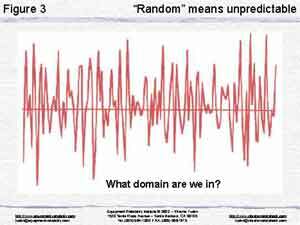 If the “real world” vibration is random, our test lab vibration should be random. Out here in California, we worry a little about earthquakes such as in the bottom trace. Most seismic events are well under 1g acceleration. But see how a building responded. Building resonance makes the center trace much larger, approaching, sometimes exceeding 1g. If someone foolishly installed an equipment having the same natural frequency as the building, further resonance might well damage that equipment. Tell your designer friends to remember this commandment: THOU SHALT NOT STACK THY RESONANCES! Let’s talk about printed circuit Boards (PCBs). Here is a PCB being shaken at the frequency of its first mode, when shaken at 174 Hz, and later thus, when shaken at 258 Hz, and later thus, when shaken at 341Hz. Sure, these displacements are exaggerated so that you can see them here. Can you visualize the damage to the connections between your components and your PCB, when your PCB rolls and twists in these modes? This next point may be difficult for you to accept, but all three modes will exist simultaneously when the service vibration is random or when shock is present. All three modes will exist simultaneously during a random vibration or a shock test or during developmental vibration screening. 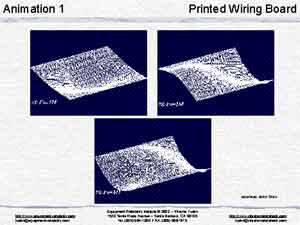 Earlier, when I was talking about the bending of cantilever beams, did you realize that I was also talking about your printed circuit boards (PCBs)? . Perhaps you think of your say 6″ x 9″ PCBs as stiff, not likely to bend. How can I help you to realize that they will bend at certain forcing frequencies? Mentally expand your 6″ x 9″ PCB to a 10′ x 15′ trampoline. You can appreciate that if you shook the trampoline’s supporting frame, the trampline would flex in not only the first mode shone here, but also in many other modes. Let’s back up to see those modes again. Your 6″ x 9″ PCB will respond like these animations. Mr. Designer, can we help you to improve your PCB designs so they will withstand all that rolling, bending and twisting? Yes, come to Santa Barbara June 23-25, and let ERI’s John Starr explain a new design tool he has developed. Or John can bring this training to your facility. Mr. Test Lab Manager, would you like to send a few of your newer test engineers and technicians to one of these cities? Or have me come to your facility to train a larger number? Please ask me for a proposal.